When you have a little too much fun taking outfit photos, you tend to have a hard time choosing which ones to post. The result? 10 million photos of me doing the same things over and over again. Ack! I humbly ask for your forgiveness. It was a sunny day when I wore this outfit out. None of the thunderstorms that’s been hitting Manila these past few days have arrived yet. Daisies on my shirt and cute little birds on my shorts–I was clearly inspired by the sunshiny weather. This is how you wear sequins during the day. Adorable!! Yellow bags are always so perfect for summer outfits. FYI, this satchel is proudly Pinoy! usually how many days before you receive your order upon placing them? Hi Cammile, just wanna ask if you had problems ordering from Choies? kasi my sister is planning on buying her brides maid dresses and shoes on the site. You have great style! And I absolutely love those shoes especially. How high is the heel? I think around 3in? :) Thank you Lala! such a dazzling chic! :)) i super loooove you miss Camille :) such a fan here! love yeah! Thanks Honey! Haha! :) Go for it! I love your whooooole look!!!! So summer-ish!! Too bad it keeps raining here! Did you somehow adjust the color of the photos?? Hahaha! I didn’t though. Baka it’s just nature’s effect LOL! :) Aww thank you to you and your officemate! (i’m sure naman hindi ikaw naglalaba pero let’s make it this way para hindi na ako mahirapan pang mag tanong. haha) Cams, how do you wash sequined or beaded dress/top/skirt? put them in a mesh/net bag? oh, by the way, may I just ask, do you go to the salon to get your hair done for your outift post… or your hair is really naturally straight? 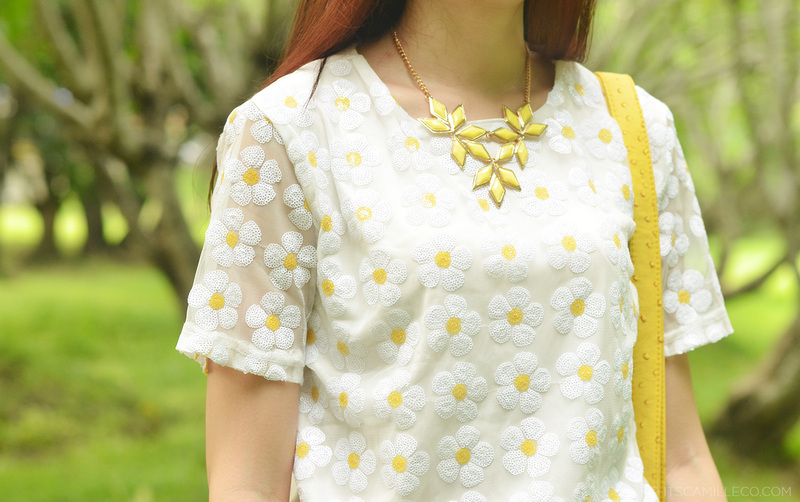 Sunny, yellow, white — a recipe for a great look! 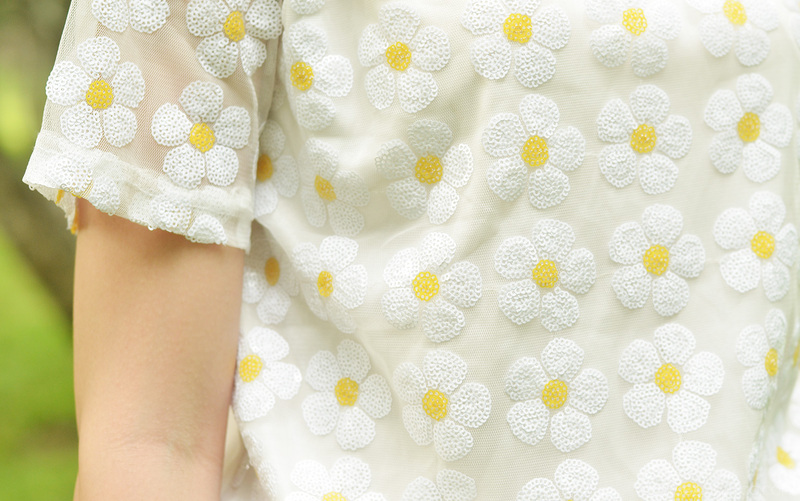 I love your daisy top! I couldn’t believe the petals are made from sequins! This is great for a breakfast date! I’d like to dress up in a white muumuu and serve you a plate of bacon and omelettes plus a glass of orange juice. Haha! Bacon and omelette! Sounds good to me! :) Thanks Angelic! Aww Green ang background fresh sa mata, bagay sa outfit :) green background + flowers + birds hihihi PerfectCombi !!! Super nakaka goodvibes naman ang outfit mo. sunny sunshine kahit na lately panay ang ulan. and its ok kahit 10 billion photos pa yan, hahaha. ganda mo kasi eh. I’m love the outfit, chillax lang ang peg. I miss your blog! Finally my internet connection is now working! :) Feeling ko parang new reader uli ako! I love your top! Daisy my fave flower! It was a great sunny outfit and perfectly matched with the nature background:) Cutie daisy top and satchel bag, i like. First thing that popped in my head when I saw your top : @garypeppergirl! This is super adorable, Camille! Omg i love the top its so cute!!! Its sequined but its not too “shiny”!!! Omg everything just goes so well together. Many many thumbs up!!!! your so cute in this outfit miss Camille. Btw, did you cut your hair a little shorter? So beautiful, adore these photos! You should! :) Thank you Christine! Hindi naman! Haha! The view just inspired me to pose more LOL! :) Thank you Vina! Beautiful photos! I love the top and shorts and how you’ve styled them together!! awwww you look so lovely, cute and fresh..actually i don’t mind a million photos haha! ankyut mo parin,parang teenager lang. Hi Camille. I know you were using BB creams before for make-up. Do you still use them now? I thought nag pa outfit post din yung girl sa last mo na picture… lol… Ahhh ang ganda ng outfit! Ako I prefer to wear bright colors kahit na umuulan… nakaka depres kasi yung rain sometimes. They’re okay I guess. I think I’m way past their target market though haha! I don’t really know the members. The photos are really pretty. love the daisy and bird outfit, total summery!!! Camille! May nakita akong local shoe maker na ginaya yung A.Wang gladiator heels! Pina-customize sya ni Vice Ganda. I guess gusto nya makatipid kaya nagpasadya na lang sya instead of buying the original ones. I forgot na who made it for him eh! Kainis nga! Irerefer ko sana sayo! I wanna see you wear one! Ganda naman diba nung pagkagaya! I thought nga he was really wearing Alexander Wang e! Yun pala pinagaya lang nya. Ask mo na lang si Andre Chang if you really want one. Stylist sya ngayon ni Vice eh. :> Sana magpagawa ka! Ohhhh maybe Gold Dot? :) Looks so cool! You look like little miss sunshine!